Any bug numbers that we can trace for these developments? Those would look nice, and be useful. The way Firefox moves tabs has been a huge beef. Epiphany on GNOME has done it this way for years. It works. I would recommend making a new tab active immediately, even before the animation is finished. 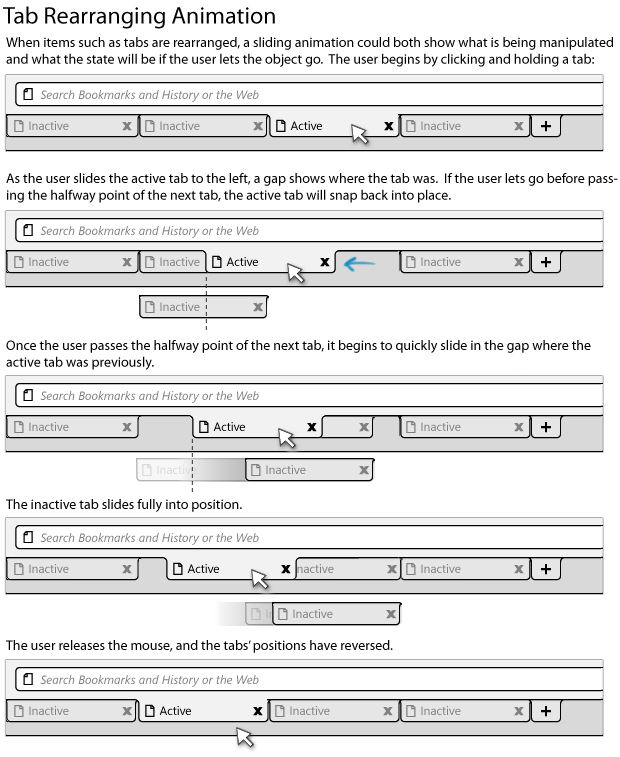 One of my biggest complaints with IE is how long it takes for a new tab to become active. Mac OS X offers this animation in all the tools when rearranging buttons. The Camino browser already has this. I really like how Safari handles tab tearing with the tab turning into a small thumbnail of the page you’re dragging, as it helps communicate exactly what state the tag drag is in. Other than that, I think all of these would be great additions. This is good and all but what about tackling the other 402 polish, uiwanted, useless-ui bugs first? Quite a few over 4 years old and the majority were created with the Firefox 3.0 release and later releases. I’m sure joe the average user could care about the eye candy effect when he finally figures out he can drag tabs. There are issues out there that would actually keep people from using Firefox, this isn’t one of them. sorry, I meant to say joe the average user could care less about the eye candy effect. This is great as long as it doesn’t add any extra time at all into the processes. The button/tab-moving stuff can pretty easily be made instant, I’ve seen that happen elsewhere. 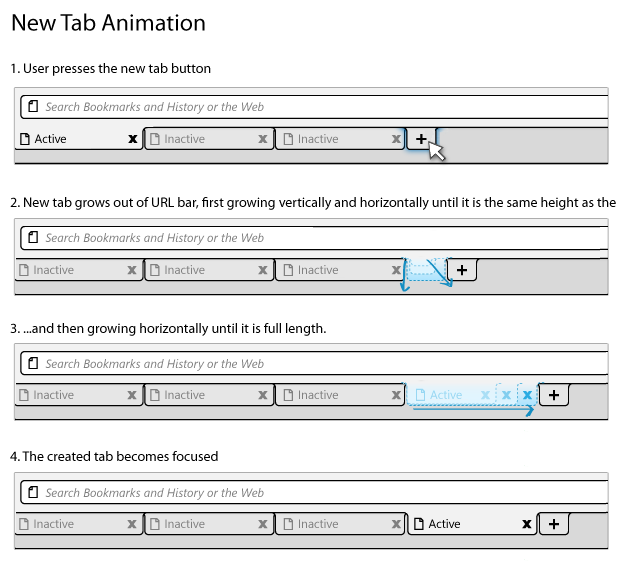 I think the new tab animation will probably need to happen in under 100 or 50 ms for me to think that it’s fast enough. But then again, I rarely actually *click* on a new tab immediately, so who cares? As long as the tab is actually active immediately and I can type in the URL bar, that might be okay. But then again, because there’s still an animation going on, I might *think* I have to wait, and that’s probably just as bad. The benefit of these effects is to help the user maintain focus. Human beings are visually oriented and these visual cues give you better situational awareness–your attention is more “in sync” with the browsers activity. This kind of visual feedback also helps novice users learn the user interface faster because you have a clearer visual confirmation of what you just did (be it purposely or accidentally). The resounding success of Windows and Mac OS is entirely due to the fact that they created animated graphic workspaces. When these products launched, only a handful of stubborn users rejected such “eye candy” for the standard text user interface. In reality, these visual enhancements make us more productive and better at multitasking. If you don’t like the product, you don’t have to use it–but don’t try to hold the rest of us back while pretending to represent the majority. While few people may have a need to drag tabs around, many of us are quite pleased that more attention is being devoted to the UI. Some of these graphically-oriented extensions are more popular than skins, for example–and infinitely more practical. So it is precisely the kind of things which are discussed in this blog post that people want. But they often don’t know they want it until they see it. And they often don’t see it until it ships with the browser. Now Firefox is the most powerful and flexible browser available, but it has always lagged behind the pack in terms of what we call “look and feel.” Kurt’s gripe about these bugs may be legitimate, but I think he is missing the point: no software is bug-free. If we stopped development work on the user interface until all of the bugs were fixed, we would still have a text-based operating system. There must be some kind of balance for progress to occur.